I am not sure if there isn't an answer to my question on this thread already, but if I buy a Canon EOS M via Ebay, from Japan (which has only japanese and english languages), can I install ML on it? Is the japanese version compatible with ML? Sorry if it is a dumb question, I tried to find the answer for about 2 hours using google, but I couldn't. That commit got through more tests, lots of UNCACHEABLE Fails but those might be the timer errors that can be ignored? It still gets stuck on stub_test_exmem and I'm still trying to narrow down where the problem is. When talking about computers, cache usually refers to memory, not timers. What's the status of the Debug -> Free Memory dialog box? I put the latest couple of logs in the dropbox folder. Oops, I was trying to figure out what was tripping up stub_test_exmem but couldn't figure it out. Impossible to do a screenshot of this is it? That red scrollwheel also looks like a bug, and the duplicate menu warning is yet another bug. If you wait for a few seconds, does it come up with valid numbers for all entries, instead of 0? The red scrollwheel comes on after the screen refresh hack kicks in the first time. That was because the ML menus kept timing out. Sorry, your post was almost lost with all the recent testing. Yes--One of my EOSM's was purchased from Japan via ebay and there was no problem installing Magic Lantern on it. Make sure it is an original EOS-M and not an EOS-M2, M3, M10 or M5. On a side note, though it is possible to port ML to the M2 nobody, to my knowledge, has taken on that project. The M2 uses the same sensor as the 100D so the autofocus speed should be improved and it includes built-in Wi-Fi along with some other improvements. Distribution was limited and there are still few of these cameras in North America and Europe where most ML developers are located. That's nice. I just ordered it. Can't wait to get it! The camera still has a maximum time of 30 minutes before the power savings kicks in and turns off the display so you'll have to do a shutter half-press to keep it alive. The bad news is that the shutter half-press will also momentarily turn on the screen graphics. Would it be possible to enable MagicLantern to stop the camera from getting into power saving? Which Canon Camera (preferable cheap / old ) would be best suited as a camera device for recording with an HDMI capture device (Atomos, HDMI Capture cards with USB, ...)? or do you have other recommendations (I have a GH2 as well). There have been lots of answers for your questions. Please search the forum. 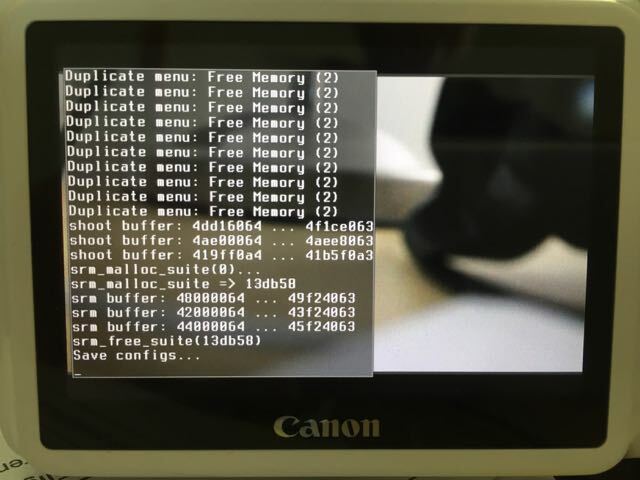 This topic is for discussing the original mirrorless, Canon EOS-M.
That said, for H.264 recording there is a restart feature and it is possible to use a simple lua script to keep the camera from going to sleep. Neither of these solutions are perfect because they either stop recording or create a glitch that needs to be edited out. Even if you settle on a way to record over 30 minutes, the EOSM battery has a rather limited run time so you should consider either the AC adapter or some sort of external battery pack. Then there's also the possibility of the sensor overheating and the camera automatically shutting down. Remember, these are still cameras not dedicated video cameras. Yo! Is it normal to have a lot of bitmap icons (exp. corr scale mostly, or exp iso) popping momentarily on top of ML settings screen? And is it normal to have several self tests crash the system? And is it ok to have temperatures over 50c constantly? Yo! Is it normal to have a lot of bitmap icons (exp. corr scale mostly, or exp iso) popping momentarily on top of ML settings screen? What you are probably seeing is the refresh that ML is doing to keep the camera from jumping out of the ML menu. Otherwise you have about 5 seconds to find and select a setting. At least that's my guess. A video showing what you are seeing on your screen would help. Just load it up on YouTube or Vimeo and post the link here. And is it normal to have several self tests crash the system? Unfortunately yes. The EOSM is very different from the DSLR's so many of the tests don't work on this camera. And is it ok to have temperatures over 50c constantly? The sensor temperature reading wasn't working properly on the EOSM a while back but it was fixed. If you have an older build you might be experiencing this. I don't have a camera in front of me right now but I believe that after it has been running for a while the temperature will probably go up to about 50c. That shouldn't be a problem. If it gets too hot it should automatically shut down. Hello friends. I'm a wedding photographer who is training cinematography. I have a 5dm3 and I'm thinking to buy a second hand eos m for raw video, I think I could record save the date sessions with this camera. I picked this camera because of the small size and also can be installed magic lantern on it. Another reason is my wife. She is learning photography and 5dm3 is too much for her. That camera will help her to learn photography also. My concern is about raw videos' size. a) For example, 1 minute raw video; how much space will it take? How many minutes can I write to this card in total and continuously? c) What is the exact writing speed of eos m? c) There is no such thing as exact writing speed. Interface is SDR50 and continuous recording will get you somewhere below 40 MByte/s. Cam should be good for 720p@24fps with 14 bit RAW. Concerning the ML menu screen, is there a way to extend the time before it goes away? I believe the current delay is 5 seconds. Use a recent ML build for EOS M. A workaround for this problem was implemented in nightly builds months ago. Hi I have been using Magic lantern on my x4 and 7D for years but have been too scared to load it onto my M due to the shutterbug. 1. If I install ML on a SD card and only use vintage manual lenses and Efs lenses will my camera stay bug free? 2. If I use another SD card (without ML) when using my Efm zoom lens will my camera stay bug free? Every time, even after all this time, when I use Magic Lantern I get a thrill! The shutter-bug hasn't been squashed yet but it only shows up with EF-M zoom lenses. They all have IS so we're not really sure if that is causing the problem. The newer EF-M zoom lenses are collapsible so if you collapse and extend the lens the bug is gone. If you untwist the lens to break the lens to body connection and remount the lens, the shutter-bug is gone. If you start, shutdown and restart in just the right timing the shutter-bug is gone. And if you use Sandisk Extreme PRO UHS-I cards 32GB or smaller, you'll never encounter the shutter-bug. Thanks for the bug correcting tips. Does the using the 'correct' SD card really work? ...And if you use Sandisk Extreme PRO UHS-I cards 32GB or smaller, you'll never encounter the shutter-bug. Yep. I can confirm this from my own experience and funny thing is I never knew how to produce this shutter-bug until I tried a different brand SD card at a later date since the Sandisk Extreme Pro UHS-I 32GB cards were my first set of SD's to begin with.